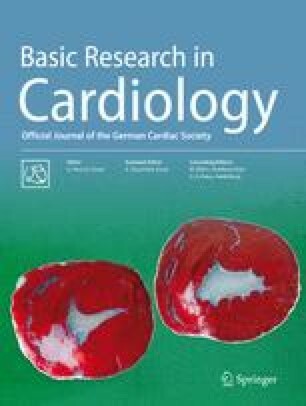 If was shown to be present in adult human atrial and ventricular myocytes but data obtained from infant myocytes are lacking. We have studied If in isolated ventricular myocytes from children undergoing surgical correction of tetralogy of Fallot (TOF; n = 5; mean age: 15.3 months). All recordings were made with the patch clamp technique in the whole cell mode at a temperature of 36–37 °C. A modiﬁed Tyrode solution containing 25 mM KCl was used to amplify If. Considering If to be present when its current density at –120 mV was greater than 0.5 pA/pF, If could be found in 28 out of 32 myocytes (88%). The mean current density was –2.01 ± 0.3 pA/pF (mean ± S.E.M.). First current activation occurred at –70 mV and If could be reversibly inhibited by superfusing the myocytes with CsCl (2 mM). Half maximal activation (V1/2) of If was at –80.3 ± 1.0 mV (n = 28). Beta-adrenergic receptor stimulation with isoproterenol (1 µM) caused an acceleration of current activation and a shift of V1/2 by 7.88 ± 1.8 mV (n = 10) to less negative potentials. This study provides ﬁrst evidence that the hyperpolarization-activated pacemaker current If is present in infant human ventricular myocytes. Our results suggest that If in ventricle of infants suffering from TOF has similar properties as If in adult ventricle.